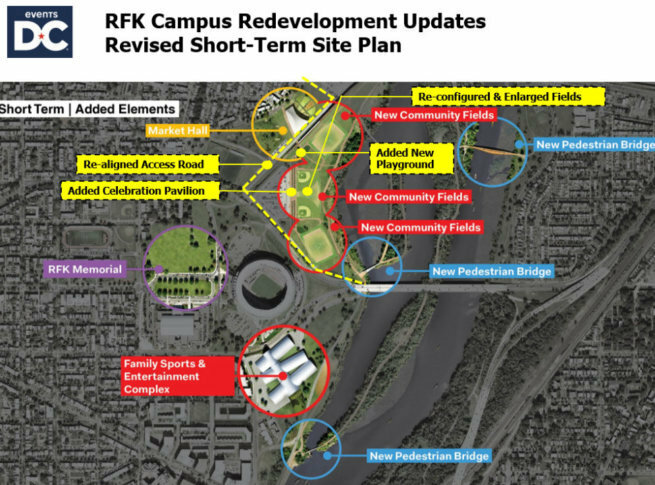 WASHINGTON — If plans stay on track, the sprawling asphalt parking lots of RFK Stadium will be converted to emerald green fields by this time next year. Events DC, the convention and sports authority for the District, said construction is expected to begin this fall on three athletic fields that will begin to transform the 190-acre site, even before the wrecking ball swings into the doomed, aging stadium. “Arguably, this was the first sports/entertainment district we ever had for this city, so we think this is really a great chance to re-imagine this for the next generation, so we’re very excited about that,” said Events DC President and CEO Gregory O’Dell. 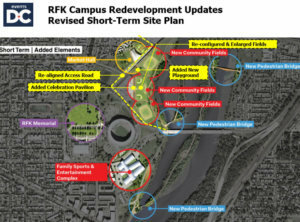 RFK Stadium’s neighbors gathered Monday evening for a community meeting and a glimpse at the developing plans for the site. The athletic fields, which will be able to accommodate soccer, baseball, softball and other sports, will be the first component in the project that is expected to take five to seven years to complete. Plans also call for a 300,000-square-foot sports and recreation complex, a market hall for dining, a memorial to Sen. Robert F. Kennedy, and three pedestrian bridges to link communities across the Anacostia River. The sports and recreation complex, which is still on the drawing board, is expected to have many different indoor courts, including a track, possibly a swimming pool, and even an ice arena. “It will be something that will have amateur sports and also after-school programming as well, anything from gymnastics, teaching, training and league play as well,” O’Dell said. While the fields will be installed first — as soon as the spring of 2019 — planners expect the sports and rec complex and the market hall will follow in the years ahead. “The market hall is really a robust food and beverage experience. We think it can have specialty foods, even some produce and prepared foods,” O’Dell said. Events DC is working with the family of Robert F. Kennedy on the early conceptual phase of a memorial to the senator who was assassinated in 1968. The D.C. stadium was named in his honor in 1969.